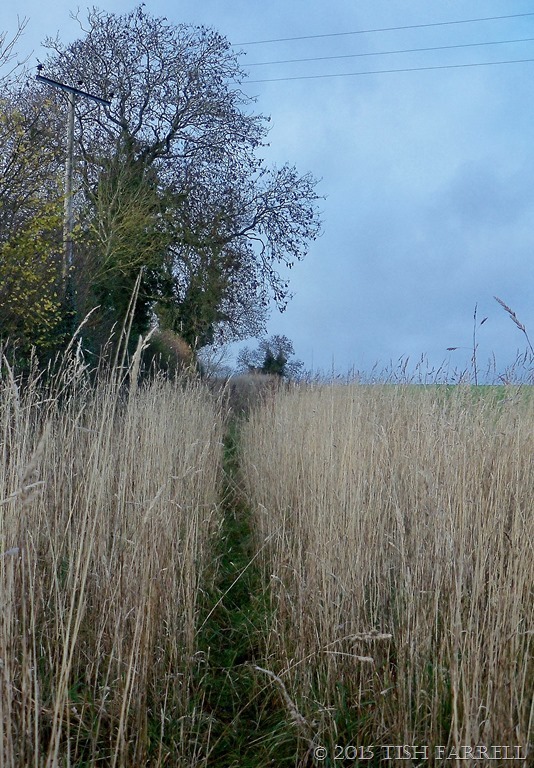 Here is my path to the allotment. I’m a bit fixated on it, and have been snapping it at different seasons. I like the way colour has leached from the grasses. 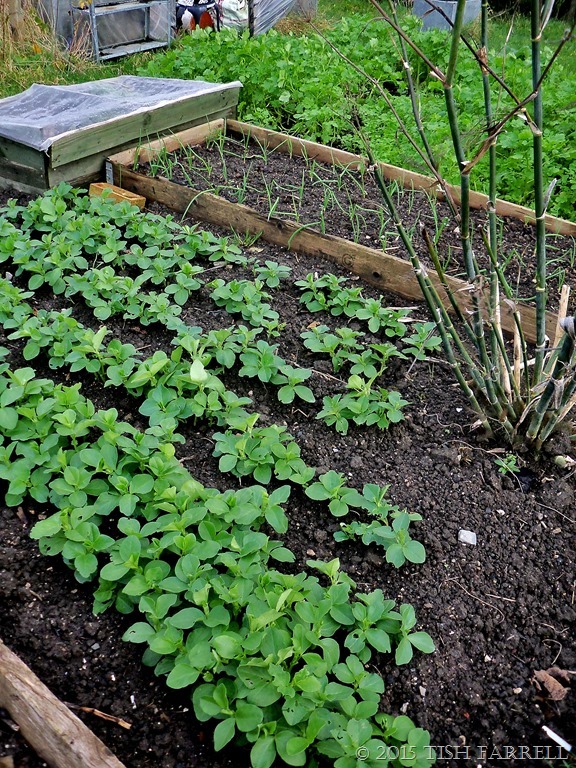 The allotment looks bleak at this time of year, not improved by the fact that many of us are untidy allotmenteers. There’s all sorts of unsightly takataka lying about – things that might come in handy for something, sometime. I’m guilty of it myself, and of course when you take on a plot, you inherit your predecessor’s junk. I’m gradually whittling mine down. There are also jobs I haven’t done – edging the beds, giving the paths a final mow while I had the chance. But I did sow my mustard at just the right time and now have an impressive crop. 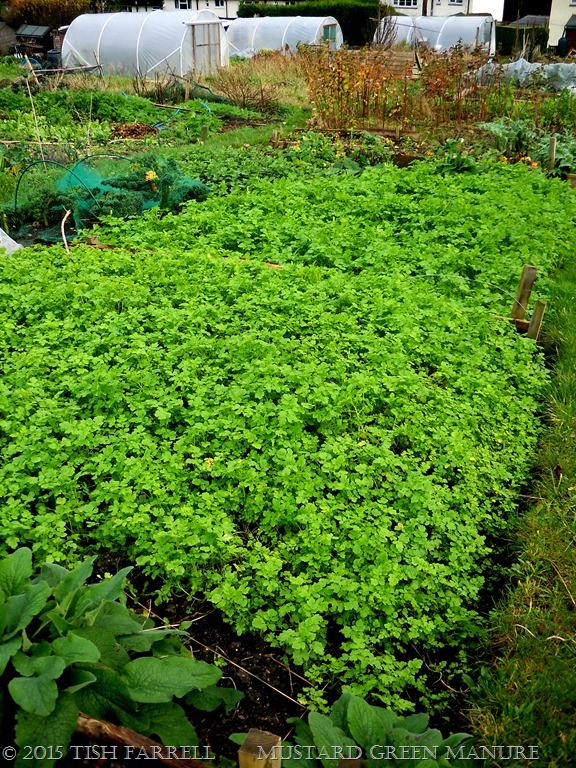 I’m growing it both as a cover crop and a green manure. If we have a hard winter it will probably be frosted and die down by itself. For now it’s still growing, and if it survives till spring I’ll cut it down and probably just let it rot on the soil surface. With green manures it is usual to dig them in before they flower. But I’m beginning to have second thoughts about digging, much as I enjoy wielding my grandfather’s sharp bladed spade. For years I’ve known (vaguely) about No Dig Organic Gardening, just as I’ve long known that mulching crops produces sturdier, tastier produce that needs little watering. But it has taken a while for the penny to completely drop. No dig cultivation is not simply about saving labour. It’s about protecting and nourishing the soil. And since today is World Soil Day, there can be no better moment to think about this totally essential, life protecting, life enhancing substance. If our soil is degraded and low in nutrients, then our food is not giving us the nutrition we need to stay strong and healthy. M.S. Swaminathan, India’s ‘Father of Green Revolution’ calls this ‘hidden hunger’. 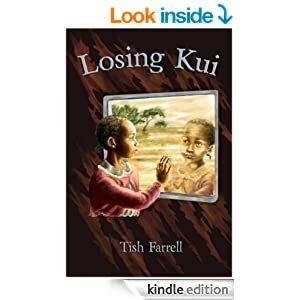 Paradoxically, we suffer from it even in rich countries where we eat all day, and it contributes to (and some would say lies at the root of) much chronic disease. Soil anaemia also breeds human anaemia. Micronutrient deficiency in the soil results in micronutrient malnutrition in people, since crops grown on such soils tend to be deficient in the nutrients needed to fight hidden hunger…Managing our soil and water resources in a sustainable and equitable manner needs a new political vision. All my gardening life I have tended towards the traditional notion that digging the soil well, weeding, and adding plentiful compost is a ‘good thing’. Yet after 8 years of digging, weeding and forking in compost on my allotment plot, I’m seeing only marginal improvements in the soil: i.e. it’s a little better than it was. In dry weather the soil surface still turns brick-hard, which in turn constricts plant growth, (and in some cases ‘bonsais’ the plants) making then weak and susceptible to pests. I then have to do a massive amount of watering which is not ideal either; it discourages the plants from rooting deeply. Also every time you slice through the soil with a spade you disturb the complex community of bacteria, fungi, protozoa, and nematodes that support vibrant plant growth. Better, then, to thickly pile shredded garden waste over the entire soil surface, and allow a microenvironment to establish underneath. The mulch gradually breaks down as all the matter is digested and re-digested, creating a nutrient rich, moisture retaining medium. I now realize I need to cultivate a cohort of jobbing domestic gardeners who will let me have their shredded garden waste rather than taking it to the recycling centre. In the meantime I decided on a little experiment. Lacking the necessary quantities of gardeners and their shreddings, I spent three hours hours yesterday digging out my partially rotted compost bin, and spreading it several inches deep over four square metres of exposed soil. It was a messy process after days of downpours. But it’s amazing what lengths this writer will go to to avoid writing the novel. The trouble is, rooting around in one’s compost heaps, turning stuff over, redistributing it, tends to be rather more satisfying than staring at the computer screen and straining one’s brain to dig out the right words. 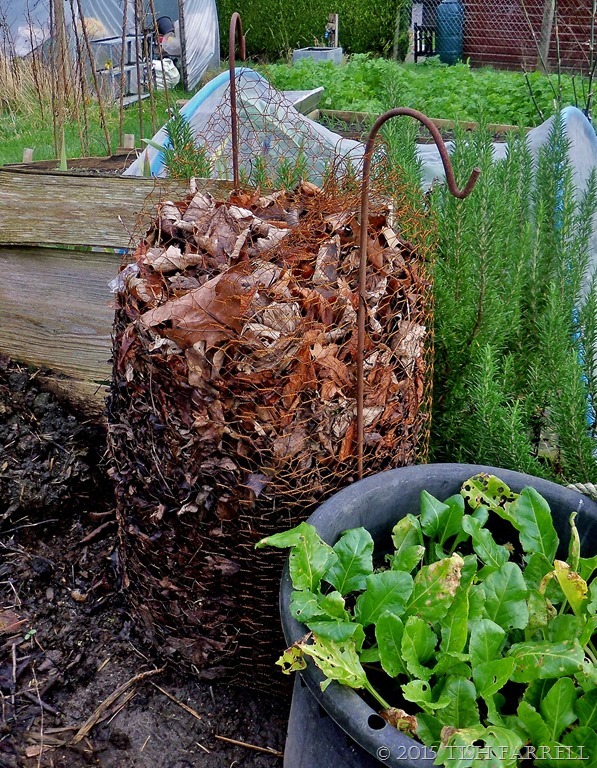 I’ve also been making simple ‘silos’ out of chicken wire, to collect the leaves and so make leaf mould. This will take a year or two, but I might try and speed the process up next year by adding in some grass mowings. The resulting dark compost is just the stuff for seed sowing, so hopefully there will be some in spring 2017. And I’ve been busy in the polytunnel. The summer’s ludicrous tomato forest is long gone and the last of the fruit turned into soup, sauce and chilli tomato jam. Now all has been raked over and planted with winter salad stuff – Chinese mustard, chard, pak choi, purslane, perennial rocket, lamb’s lettuce, Russian kale. I also have some parsley in there, onions, garlic, leeks and a bucket each of carrots and Florence fennel. The fennel probably won’t grow much, but we can eat the feathery leaves. And just in case we do have the promised hard winter, I already have the fleece ready to lay over the young plants. Last year was pretty mild, and I found that once I put fleece over everything, the plants continued to grow, if only a little. I also have two small water butts filled to the brim and stationed inside. Their presence is supposed to provide a slight increase in temperature within the polytunnel. They are also handy when the allotment water supply is switched off for the winter. Meanwhile, out on the plot, there are still lots of crops to harvest – carrots, leeks, kale, small amounts of perennial spinach, and cauliflowers. 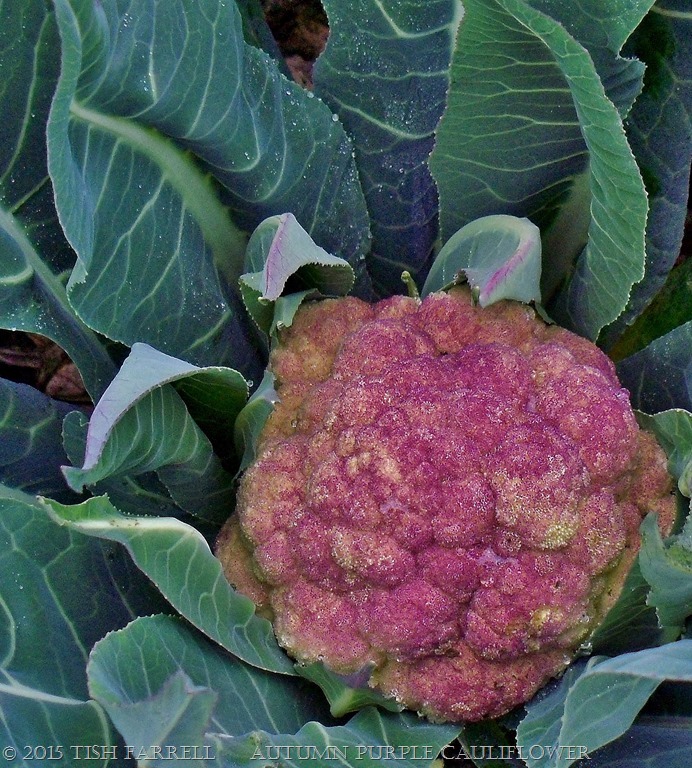 The Brussels sprouts, cabbages, purple sprouting and Romanesco broccoli are all coming along. The field beans have sprouted, likewise the overwintering Radar onions. I know I am very lucky to have my allotment. But everyone can do some gardening, even if you only have a bucket. In fact a bucket is great for growing carrots. Lack of space need not be an obstacle. A single raised bed of one square metre, topped with layers of mulch can be intensively cultivated with leafy crops. And remember, there’s no need to dig it. Also mucking around close to soil is good for lifting the spirits. Scientists have discovered it gives off some kind of anti-depressant molecules. SOIL – WE CAN’T LIVE WITHOUT IT. HEAL IT, AND WE HEAL OURSELVES AND THE GENERATIONS TO COME.